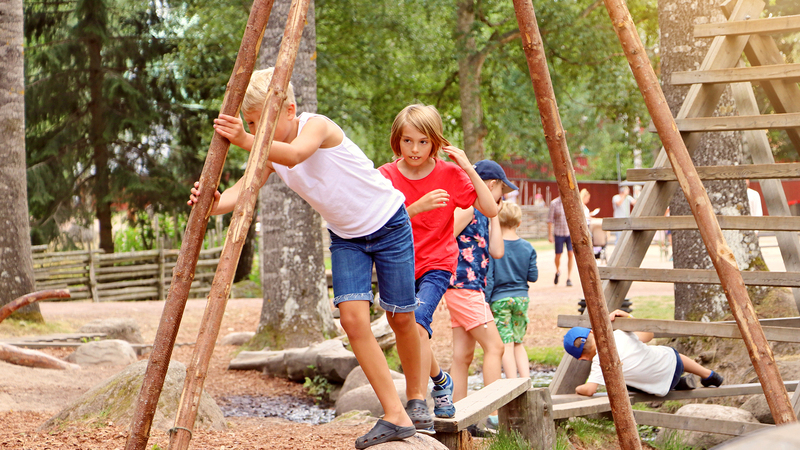 Here you can challenge each other’s courage and balance on our don’t-touch-the-ground course, or build an obstacle course and compete on hobbyhorses. The green areas offer different types of play for all ages, including water play, rocking horses, stilts and a maze for those who like a challenge. Inside the barn there is a slide, junk attic, secret passages and old farm objects. Here you can play shop, look after the wooden animals or explore the attic. There is also a well where you can get water for the wooden pigs and a small field on which you can plough and harrow together. Here you can play with water in all its forms, climb on wheels, roofs and scramble nets or go down the slide. The Mill is a place for imaginative play as well as relaxation. Matt’s Forest is full of strange creatures and exciting play. Part of Matt’s Forests is a mystical trail on which you can experience the forest close up. You may see glowing eyes of different creatures and witchery through the fog. Where the path ends, you are free to make your own way in the forest and discover ruins, hiding places and lots of other things.